I am [Maibelle Y. Lin] and my friends usually call me [Mai]. My undergraduate degree was in advertising/marketing. My interest in this class is mostly in wireless technologies. Besides, I love things that people can play with such as toys and games so I signed in this collab! 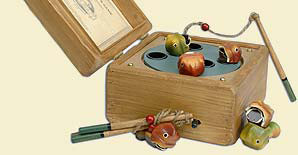 My favorite childhood toy is "Go Fishing" and now I still like it. It's an interactive toy with a turning circle platform (keep turning unless you turn it off ) and lots of frogs/fish hide inside. People can use fishing poles with magnet to catch frogs/fish.